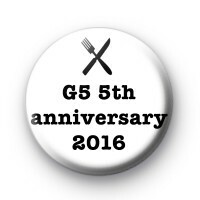 Custom foodie button badges for Catherine Rainey and her G5 dining group. White button badge with crisp black font reading G5 5th anniversary 2016 in black font and an illustration of a knife & fork. The perfect badge for food lovers & foodie types. Standard 25mm pin badge hand made in our UK workshop. We have loads of awesome badges available on our website so be sure to check them out.